Dr. DeFoore's Healing Anger Newsletter entitled "How Fear & Anger Fuel Each Other"
Fear seems weak, and anger seems powerful. While in some ways that is true, it's also an illusion. Healthy fear can keep you safe, and unhealthy anger makes you weak and vulnerable. We'll look at how these two powerful emotions can feed into each other, making things worse, and then we'll look at how you can work with these emotions to make things better. Nobody wants to be weak and afraid, and unhealthy fear and anxiety can even create a feeling of helplessness. Anger is the push-back, strike-out emotional response, so it is sometimes an instinctive, unconscious reaction to fear, as a sort of "solution" to the problem of feeling helpless. When your anger comes out in unhealthy, destructive ways, however, it makes things worse (sooner or later), adding to the fears you already had. Unhealthy anger often comes as a "last resort," when you're feeling helpless and at your wit's end. Helplessness is unacceptable, and that's how this fear-anger-fear cycle gets started and keeps going. At worst, you may start feeling helpless in your efforts to control your anger, which feeds fear, and so on. Domestic violence can easily be seen in this context. Family is the heart and focus of love, which can bring up all kinds of issues with fear and the need to control, and that control turns to anger. To solve these problems, all of the underlying issues have to be addressed, and working with the fear is just as important as working with the anger. "Some of the most destructive anger comes straight out of a frightening feeling of helplessness and powerlessnes." 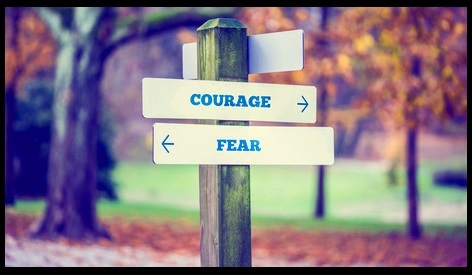 Developing courage is the solution we're proposing here, because it incorporates the best of healthy fear and healthy anger into a sense of empowerment and strength. Watch this motivational video called simply, "Courage"
How Can Anger And Fear Build Courage? Anger is never going to go away completely, and neither is fear. They are as natural to your makeup as your bones and blood. As a matter of fact, you'd be dead without them...they're a part of your safety/survival mechanism. The only way to win with these two powerful emotions is to make them healthy. First step is to know your fears. Ask yourself what your biggest fears are, then revisit the answers until you feel that you've listed them all. Next, explore the pain and trauma underlying those fears, and use the inner child program to heal those wounds. Then start setting your intentions powerfully to reach your goals and create the life you choose for yourself, and encourage yourself along the way. Use the incredible power of your healthy anger to get the job done, once and for all. So you've probably figured out by now that healthy anger and healthy fear lead you straight to the heart and soul of your courage. Believe in yourself and your dreams. Awaken the champion you were born to be, and express your truth in your own, unique way. This highly effective audio program, available as CDs or MP3 download, will help you understand and create healthy anger in your life. 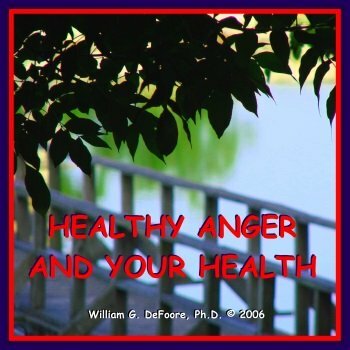 In this program, Dr. DeFoore will guide you through an understanding of how anger gets to be unhealthy, and how you can turn this around so that your anger becomes your greatest ally. Get your copy now. New web pages for you. Read new contributions from good folks like you, such as My Road Rage Scares Me And Makes No Sense by a man who feels out of control when he's on the road, and I Keep Failing At Everything And I'm Losing Hope by a young woman struggling with anxiety and anger, while still living at home with her parents.